Fall is a great time to be out shooting and not just the leafs. North American mammals are in their prime for the season and is a great time to be photographing the big boys that roam the land. 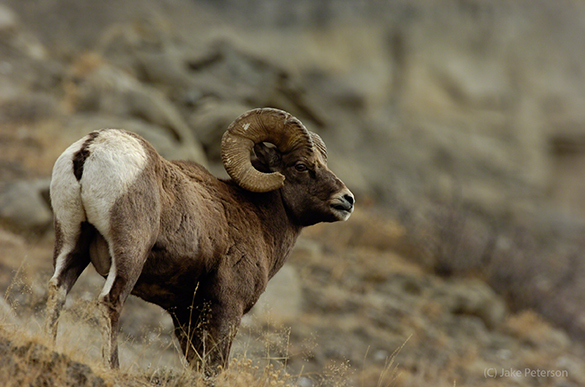 One of my personal favorites has always been the Rocky Mountain BigHorn Sheep. Fall is great time for these guys because it is cold enough that they tend to move around more. In the summer time it gets too warm so often they spend their days in the high mountains bedded down to keep cool. In the fall they come in altitude making it easier to work. Keep in mind that these critters have feet like suction cups that allow them to walk up the cliffs that would be impossible for a human to walk up. Having them at a more workable level is important. One of the important rules to consider when working with large mammals is how to compose the animal and where to crop into. Now there are no defined rules but just like with a human there are spots that are just awkward. This is one of those border line examples because yu can’t see the legs but you know there is a vertical drop cover up the legs. It’s very important to watch these natural details while shooting.